1 of 3 Cut up cheddar cheese and place in a food processor. Pulse until broken up and almost ground. Add cream cheese, milk, dill, garlic powder and pepper. Pulse to blend evenly. Transfer to a large heavy-duty plastic bag. 2 of 3 Peel cucumbers in strips, or peel whole cucumber, if desired. Cut into 3/4-inch-thick slices, about 15 per cucumber. Using a melon-baller, spoon or measuring spoon, scoop a small amount of flesh from the centers of the slices. Let slices sit, hollow-side down, on paper towels for 5 minutes. 3 of 3 Snip a corner from the bag with filling. Pipe filling into each cucumber slice, dividing equally. Serve immediately. 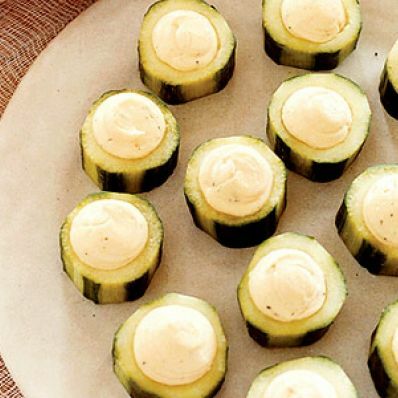 Note: You may prepare and refrigerate filling ahead of time; let warm up slightly before piping into cucumbers. Per Serving: 2 g sat. fat, 12 mg chol., 3 g Fat, total, 1 g carb., 0 g fiber, 70 mg sodium, 3 g pro., 46 kcal cal.